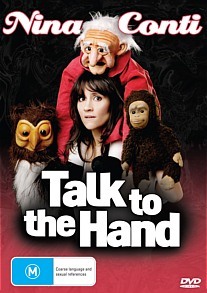 Nina Conti: Talk to the Hand DVD Review. A real treat for Conti fans, and a strong release which shows Britain’s foremost ventriloquist at the height of her powers. Over the past several years talented British ventriloquist Nina Conti has built a massive fan base in Australia, touring to sold out shows around the country and repeatedly proving herself one of the standouts of the international comedy circuit. Filmed as part of her appearance at the 2011 Sydney Comedy Festival, Talk to the Hand marks Conti’s second foray onto DVD and finds the comedienne in predictably fine fettle. Described by UK’s Mirror as ‘gut-bustingly funny’, the show itself revolves around her now familiar cast of furry sidekicks, including the irascible Monkey and poetry-loving Owl, as well as relative newcomer Gran, an elderly Scotswoman who tempers some of Monkey’s more acerbic observations with a touch of gentle whimsy. Conti also incorporates more jokes and improvisational humour into her act, ensuring no two performances are ever the same, and indeed some of the evening’s most delightful moments are those least predictable, as when monkey indulges his penchant for audience interaction or composes songs based on random words thrown up by members of the crowd. In addition to the hour-long show itself, Talk to the Hand includes a number of worthwhile bonus features, including a 10-minute sketch entitled ‘One Free Hand,’ footage of the irrepressible Monkey backstage, a short interview and a 9-minutes extract from a prior Edinburgh gig. A real treat for Conti fans, and a strong release which shows Britain’s foremost ventriloquist at the height of her powers.